Entry filed under: Alzheimer's, Gifts For Quilters. Little Crazy Quilt	Vote For Madison! I would LOVE one of these for lots of reasons. And there are so few of them, that makes them even more valuable. I’m really cheap, but would probably pay $25 for one handmade by you – maybe more. People are coming to Houston to spend money, and this is a good cause, so charge a lot and they’ll sell. Good luck! Yes, sell them!! They can always be used for other shows. Price wise – $12 – $15 each – people will buy. $25 minimum or Best Offer (you never know, someone might hand you a $100 bill and say keep the change!). It’s a great idea, I’d have loved to have one on our latest cruise so I could cary my room key when I had no pockets! Or for the gym so you could have your ID card and pass card. I’d like to pay $5.00 but for charity would probably go as high as $10. HOpe I’m not a cheapskate! 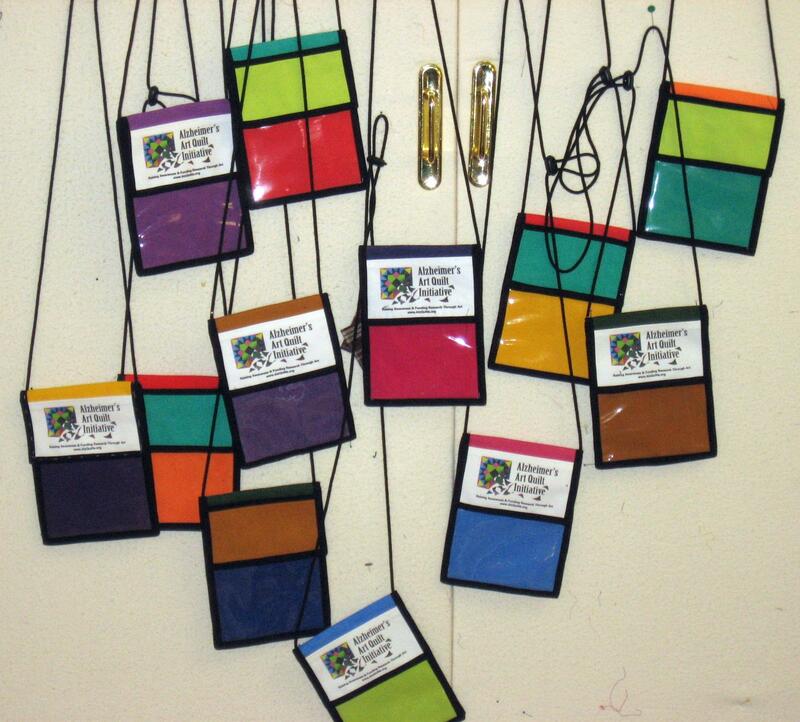 Those aren’t just badge holders – – they are also passport, airline ticket, ID, money, important small stuff holders! I should think they would sell for between $10-15. I’d definitely but one. $10 minimum. (Actually I”d pay more since it’s a good cause, but I’m trying to guess what others would think.). They’re really cute. And useful. Charge $5.99. Anything made by U is something precious to own! I would buy one right now – don’t think $10.00 would be too much. I’ve been discriminated against, again. (I started practicing law and then teaching law in 1960, before the Civil Rights Act was invented, so you know discrimination has happened to me before.) I want one of the badge holders, but I will not be at Houston. Can you make some extras to sell online? I’d pay $20-25, since the proceeds go to Alzheimer’s. I think you’d sell more if you charged $10, although $25 would make more money. That’s something you have to consider – charge less and sell more, or charge more and sell fewer. I would certainly pay $10, but probably would not pay $25 – and I am a cheapskate, I know. Or should I say, frugal…..
Be reckless! Just ask for a donation for Alzheimer’s. You will be surprised how well you will do. 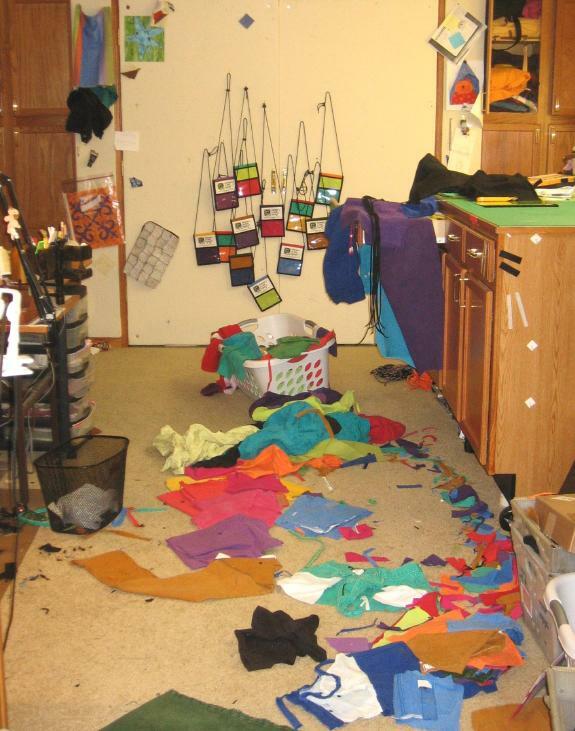 My sewing room floor used to look like yours most of the time. However, I had to change my ways since moving to a one bedroom apartment. My sewing area is at one end of my kitchen. I won’t mention how the bedroom looks. My friend was right when she said that all my “stuff” would not fit in the apartment. Madison, you are a hunk. Donating the name badges to alzheimer’s initiatives @ Festival and charging $ 25.00 is a good idea. I can see them used as passport or money holders when traveling abroad. Ami, I would feel so at home in your sewing room. It looks just like mine. The floor is sooo handy for “catching things”. I agree a $10 minimum..what a fun idea! Just when did you sneak into my sewing room> I didn’t even know I was making those badges. I guess I would ask for a donation and hope that people are generous rather than asking too much and people not buying them. But what do i know, I didn’t even know I was making them in my sewing room. Good Luck in Houston, wish I was there. For a donation, I would pay $15- $20, but otherwise $10 is good. Please, please make up the pattern to sell! I have been looking for something like this, or is it a pattern already? Lovethe funky jeans! Gee…I think I paid at least $15.00 for a plain one from the last Quilt Camp I attended, so definitely $25.00 for a purty cool one. and…pretty sure there are many of us who can go toe to toe with you on the messy thing. I had to clear off my dining room table (which can be seen from my front door) so I wouldn’t be embarassed when the trick or treaters came. Yes, indeed…it was bad. I don’t think $25 is out of line. It’s for a good cause and a useful item. The Lowell show gives out badge holders when you register for classes. I use them when we travel; they’re great at the airport to keep your boarding pass, license, and some money. We go to a camp where you need to show an ID card at meals, so I wear my badge holder. Or just for shopping — credit card, license, money. I’m with those that suggest $25. Having been to Quilt Market, getting a badge holder that is made of durable denim would be such a blessing! Thanks to you for all your work on Alzheimer’s funding. $25 is perfect given it’s made by you and it’s a donation. It’s definitely not too much and for such an important cause. They’re wonderful. Great idea just in time for Quilt Market! I was going to suggest $20, but I agree with many previous commenters – $25.00 would be a good price since it is also a donation to Alzheimer’s. I would dearly love to have one. 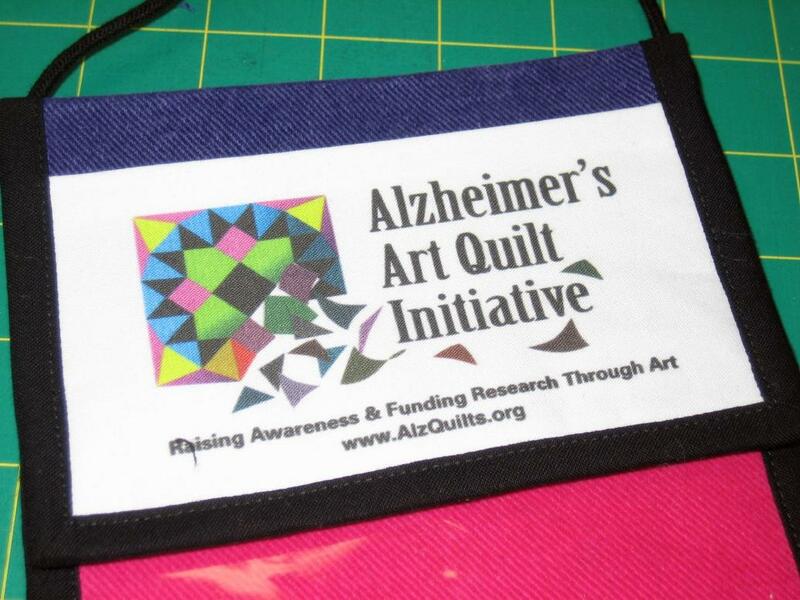 I have been on the Alzheimer’s Memory Walk committee for several years in our small town—This year I also was chair person for the walk—I do quilt among other things. This year our Memory walk raised $41,000 toward Ending Alzheimer’s Disease. Last year our walk was number one in the nation for dollars raised in a rural area. Keep doing what you are doing toward ending this awful disease!!!! I think that $10-15 would be a fair amount. Perhaps you could put a “minimum donation” or “suggested donation” price (for example, $10) on them, which might make them accessible to those on more limited budgets, but leave it open for those who would like to donate more. I agree with Karen (message #17)–how about a pattern so those of us who won’t be able to buy one from you could make our own?! Have a great time in Houston. Wish I could be there! I am the proud owner of this badge holder as I am on the board and let me tell you how handy it was during the show. It held my money, my credit cards,my drivers license, my lipstick I never had time to put on as we were so busy selling quilts, my phone, my business card, chewing gum, a couple other things I can’t remember but the best thing it held were the pins and bull noses I kept taking off and on the wall each time we sold a quilt. If this is not the best testimonial for the design of this badge holder, I don’t know what more I can say! I think we have 4 left so…..hurry up and see what you need to do to get one!